Led by rattlesnake researcher, Bryon Shipley, the Plains Conservation Center (PCC), with East Alameda Veterinary Hospital and Dr. Kevin Fitzgerald, along with Animal Planet, have been collaborating on a 2 year study of prairie rattlesnakes which ends in late 2006. Each spring, radio transmitters were surgically implanted into 12-14 rattlesnakes, which were then released back into our prairie preserve. Throughout the late spring, summer, and early fall the rattlesnakes were tracked using a radio receiver and directional antenna. Each rattlesnake's transmitter corresponds to a different radio frequency and that radio frequency becomes the rattlesnake's �name� during the study period. For example, a rattlesnake whose radio frequency is 150.920 megahertz becomes �920�. The K/T (Cretaceous/Tertiary) Boundary marks one of the two most awesome annihilations of life in the history of earth. At the K/T boundary, 70% of life on earth—including dinosaurs, flying reptiles, most marine reptiles, all ammonites, all baculites, 50% of land plants, all North American marsupials, and a great percentage of marine plankton—disappeared from the fossil record, never to be seen again. Found diagnostic Paleocene mammal jaw just 12m above the strata of focus. The West Bijou K/T Boundary exposure is not only globally significant in that it will further illuminate the catastrophic event and how earth recovers from such events, but it also stands to recalibrate geologic time! Drs. 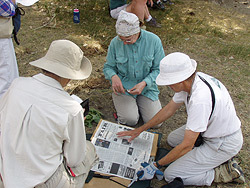 Janet Wingate and Lorraine Yeats have been documenting and collecting botanical specimens at the West Bijou site of the PCC since 2003. After the specimens are collected, pressed, and dried, they are mounted and become part of the Denver Botanic Gardens herbarium collection. Herbarium specimens are concurrently being collected for the PCC and the University of Colorado. To date, over 275 plant species have been identified and collected. Dedicated birders Karen Metz, Ann Bonnell, Sandy Schnitzer, and many others have worked since 2003 to compile a species list and document bird sightings on a monthly or bimonthly basis. This will enable the PCC to track the changes in bird populations over time. A list of species sighted and summary of the numbers of birds seen each year will soon be available here. Interested in climate change? Participate in a national citizen science effort in your own backyard or nearby park that you visit frequently. You can follow plants like aspen, common yarrow or western serviceberry to see when budburst and bloom occur. Compare with other scientists like yourselves - log on and check "Participate"- find the activity guide and data collection sheet and you're on your way! Go to the Budburst website. Networks of incised dry channels, often called arroyos or gullies, are common features of prairie and desert landscapes. These channels form an important part of the ecosystem and water cycle. Thanks to occasional flash floods and the shade provided by their banks, gully networks tend to be zones of high soil moisture that support less drought-tolerant plant species. The deeper and more vegetated channels provide shade for wildlife, and their walls offer burrow and nest sites for birds and small mammals. Dr. Greg Tucker, Assistant Professor of Geology at the University of Colorado, is studying the rates and patterns of gully channel changes at the West Bijou site of the PCC. 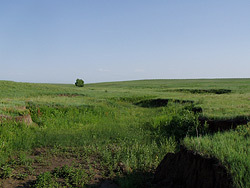 Metro State College professor Dr. Jonathan Kent and his archaeology students and volunteers are conducting surveys to document areas that show evidence of previous human inhabitants of the PCC’s prairie lands. So far, they have surveyed about a quarter of the PCC’s West Bijou site, documenting sites and isolated artifacts. 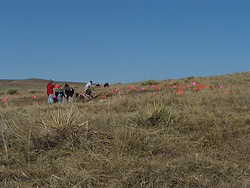 The Colorado Archaeological Society will augment these surveys during October and November 2006. We welcome drop-in visitors Monday – Saturday year-round. Monday - Saturday hours are 8 am - 4 pm, no admission fee. Reserved programs will be offered year-round, please see “Calendar of Events & Activities” for upcoming programs. 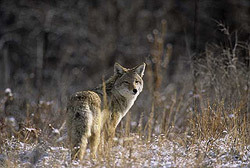 The Plains Conservation Center is a registered 501(c)(3) non-profit organization. 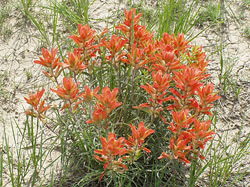 Web Site Copyright © 2012 Plains Conservation Center. All Rights Reserved. Our Privacy and Security Policy. Web Site Development and Hosting by Blue Ray Media, Inc.